Philosophy - DOWNEY RANCH, Inc. Range cows & bulls raised under real world conditions. 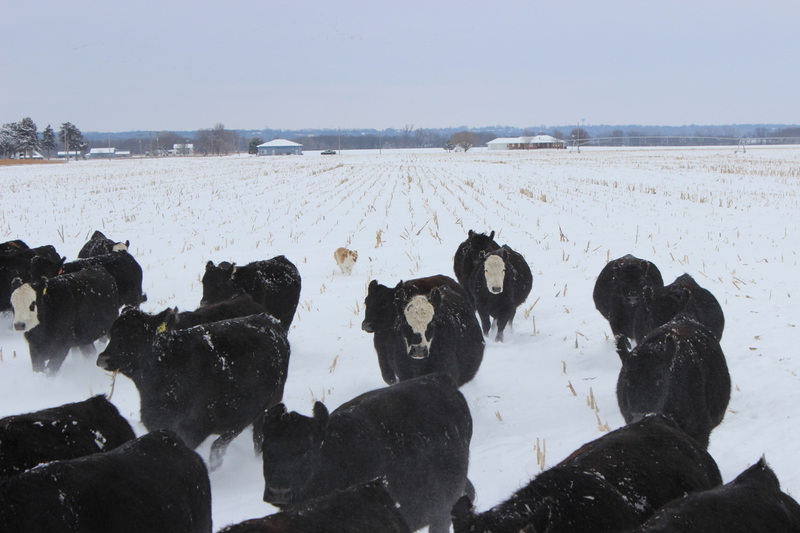 DRI Registered and commercial bred heifers on corn stalks, January 2014. Our operation is different from a lot of seedstock operations. The largest number of our cows are COMMERCIAL cows; not registered. Thus, we understand first hand that cows have to be able to perform under low-input situations. A cow that can breed under range conditions year after year is your best bet for producing seedstock that will have innate fertility in your operation. A lot of seedstock breeders' cattle never have to "work" for a living. If those daughters come into production 3 years after you bought a bull, wean their first calf and pull up open, you have an expensive problem and 3 years of genetic movement in the wrong direction. We love EPDs and genomic data and use it as a selection tool. However, it is not our only selection tool. Cows have to be cows FIRST, meaning they must have all the convenience traits (fertility, good udders, sound structure, workable temperaments, etc.) necessary to produce a live calf and get it to weaning every year. After that, we can ice the cake with some really nice carcass performance among other things. But all the carcass premiums in the world won't keep you financially sound if you don't have a live calf to wean first. The best EPD set in the world, whatever that might be for you, means nothing without a producing cow. Our bulls are handled in such a way as to make sure they're rugged, sound and free from fertility problems. Sure, 13-1400 lb yearling weights look good on paper, but if the whole pen has those kinds of weights, you need to ask yourself why. Are they fed too hard? If so, they may be fat and out of shape, not good things in a range bull. They may have been overfed at some point and have liver abscesses (reducing longevity), they may have fat deposits in their scrotum (reducing fertility, especially during the warmer months), and they may have had undue stress placed on immature bones and joints, leading to soundness problems down the road. The other way to get a whole pen of 13-1400 lb YWs would be to have bred for bigger cattle. Those type may have their place, but you need to consider carefully what that place might be in your operation. We bring you 20 month old bulls at sale time and believe that benefits you greatly. First, you have an older bull that can immediately cover more cows. They can be brought along in a reasonable way that helps elimate the problems we talked about above. While we don't sell our bulls until they're 20 months old, all the bulls are fertility tested as yearlings to ensure they've reached sexual maturity at an appropriate age. We then test them again before sale to make sure they're are no problems.